From New York or north Jersey: Take Route 78 west to exit 17, merge with Route 31 north. At second traffic light, make a right onto 513 north through High Bridge. Follow signs to the park. From Pennsylvania and western New Jersey: Take I-78 east to exit 16, cross Route 78 to traffic light. Proceed through traffic light. At stop sign turn left, merge onto Route 31 north. At second light on Route 31 north turn right on Route 513 through High Bridge. Follow signs to park. Voorhees, like Parvin State Park, served as a camp for the Civilian Conservation Corps (CCC) - Franklin Roosevelt’s program to get people back to work during the Depression. The CCC planted trees and constructed shelters, picnic sites and trails throughout the park. 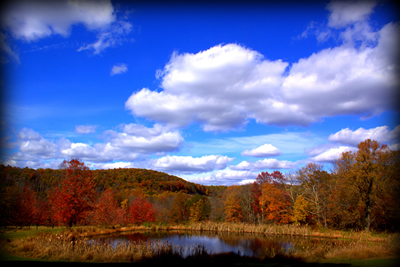 Two overlooks provide scenic views of Round Valley Reservoir and Spruce Run Reservoir. Memorial Day Weekend through Labor Day - 8 a.m. to 8 p.m.
Office Hours: the office is temporarily closed. Camping reservations and other information regarding Voorhees State Park can be obtained by contacting Spruce Run Recreation Area at (908) 638-8572. Note: Campgrounds open yearly from April 1 through October 31. From 1933-1941 about one thousand young men worked at Voorhees and Hacklebarney in a Depression-era federal agency known as the Civilian Conservation Corps. The CCC was the brainchild of one of the 20th century’s leading figures, President Franklin Delano Roosevelt. The agency had two goals: to give jobs to unemployed young men, between the ages of 17 and 24 and veterans of World War I, and to undertake thousands of conservation projects across the nation in parks, forests and at historic sites. When the CCC boys arrived at Voorhees in 1933, they found three relatively undeveloped parcels of land. The park still reflected Governor Voorhees’ use of the property as a farm including pastures, woodland, barns and an apple orchard. By the time the CCC boys were finished working eight years later, under the supervision of the National Park Service (NPS) and the United States Army, they had built the present-day road systems, shelters, latrines, visitor amenities, and trail systems or major public access areas that still remain or are used in different ways today. Each CCC company had 200 men, although that number was not always maintained. 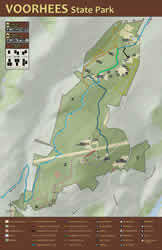 The CCC camp at Voorhees was initially known as Camp #20 or Camp Voorhees. Later it was given the designation of SP#5 with Company 1268 assigned to it. SP designated State Park and the company number coincided with the Army Corps district. CCC boys were paid $30 a month and $25 was automatically sent home to family members or guardians for their support. The boys were paid $2.50 every other week. For many enrollees at Voorhees, the CCC provided vocation and avocational classes. The education program was known as “The School of the Woods” and included job training, current events and access to a camp library. The staff of Voorhees State Park continues to pursue learning about their CCC history. All former enrollees or surviving family members of Company 1268 are encouraged to contact the park office at 908-638-6969. Additionally, in an effort to show our appreciation to the enrollees of CCC Company 1268, Voorhees is planning to erect a life-sized bronze statue of a CCC worker at the entrance of Company Street. This statue would commemorate the outstanding work of the CCC throughout this great country during the years of 1933 to 1943. Contact the Voorhees State Park main office at 908-638-6969 to learn more about how to be a part of this effort! Images of America: Hacklebarney and Voorhees State Parks. The New Jersey Astronomical Association hosts an observatory and astronomy education center in the state park. The 26-inch Cassegrain reflector is the largest working telescope accessible to the public in New Jersey. All are invited to explore the wonders of the sky at programs offered from March to November. For further information, visit www.njaa.org. 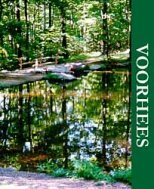 Voorhees has 7 trails that are suitable for a wide range of abilities and interests. 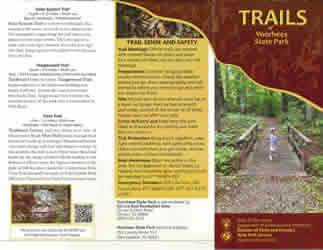 All trails in the park are multi-use except the Cross Park Trail and the Parcourse Circuit, which are footpaths only. The trails range from wide and graveled to rocky and steep in places; the parcourse is accessible for people with disabilities. VOORHEES STATE PARK CAMPGROUND RESTROOM AND SHOWER FACILITY IS CLOSED. There will be portable toilets provided, an operational dishwashing station, and potable water access on site. Showers are available at the nearby Spruce Run Recreation Area campground. Campsites: 47 tent and trailer sites with fire rings and picnic tables are available. Modern toilets and showers are within walking distance. Trailer sanitary station is open April 1 through October 31. Campsites open April 1 t0 October 31. Fee: NJ Resident $20 per night; Non Resident $25 per night. Group campsites: Two group sites with picnic tables, fire rings, toilets, showers. Campsite A accommodates up to 50 people. Fee: New Jersey Resident $100 per night; Non Resident $200 per night. Campsite B accommodates up to 30 people. Fee: New Jersey Resident $60 per night; Non Resident $120 per night. Open April 1 through October 31. Shelters: Three shelters. Cabin-like structures with wood stove for heat and two double-deck bunks, which sleep up to four people. Sites include a fire ring and picnic table. Open April 1 through October 31. Fee: NJ Resident $48 per night; Non Resident $60 per night. To view a picture of the shelters click here. Is there fishing in the park? There is Bass and Bluegill fishing available in several small ponds in the park. Is there swimming in the park? There is no swimming allowed at Voorhees State Park. However, Spruce Run Recreation Area will permit registered Voorhees campers to use their beach and swim facilities. Is hunting permitted in the park? 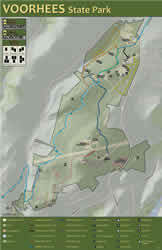 Hunting is permitted in several areas throughout the park and is subject to Division of Fish and Wildlife regulations. Are pets allowed in the park? Dogs are allowed in the day use area of the park. They must be leashed at all times. Dogs are not allowed in the campground at any time. When is the Observatory open? The New Jersey Astronomical Association operates the observatory. For days and hours of operation please call the NJAA at (908) 638-8500.